Red Bull capped a memorable 2012 for the brand when its Formula 1 driver Sebastian Vettel won his third Drivers' World Championship yesterday in a dramatic Brazilian GP. Vettel's win for Red Bull followed just months after Red Bull Stratos, the event behind Felix Baumgartner's skydive from the edge of space in a record-breaking stunt. The energy drinks brand, which was set up in 1987, has also been shortlisted for the Marketing Society "Brand of the Year" shortlist for 2012. Red Bull Stratos attracted eight million concurrent views on YouTube, marking the highest-ever concurrent viewing figure on the Google-owned site. According to a Twitter spokeswoman, there had also been approximately 3.1 million tweets sent, relating to the event. In Sunday's dramatic Brazilian Grand Prix, Vettel was pitched into a spin before recovering to finish sixth in the race. His rival for the title, Ferrari's Fernando Alonso finished second, which was not enough to overtake Vettel in the championship. 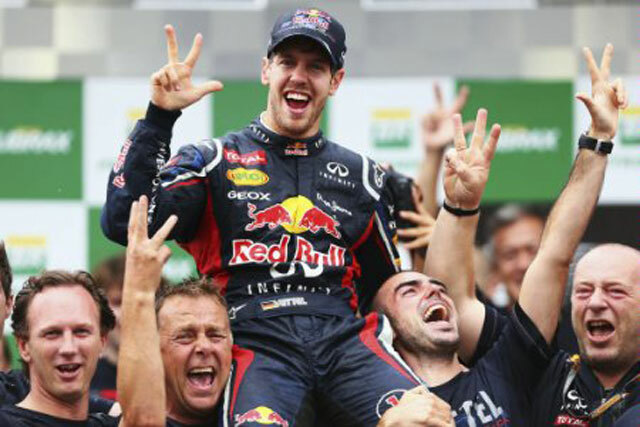 To crown its achievement, Red Bull also won the F1 constructers' championship. Next year, the Japanese car maker Infiniti is increasing its Formula 1 involvement with Red Bull after agreeing to become title sponsor of the team. As part of the four-year sponsorship deal, the F1 car will become known as "Infiniti Red Bull Racing" from 2013. Red Bull is the most popular energy drink in the world, selling 4.6 billion cans in 2011. Nigel Currie, executive of brandRapport, believes that Red Bull could match its achievements next year. Currie said: "If the key decision-makers remain, we can expect more of the same going forward. The video games market might be an area for them to expand their expanding presence, but their big success this year will delay any thoughts at the more traditional marketing channels for energy drinks.